"Honey and salsa come together to make an easy summer meal that will rock your taste buds!" Mix together the mayonnaise, cucumber, 1 tablespoon of honey, 1/2 teaspoon of cayenne pepper, and black pepper in a bowl until smooth. Cover and refrigerate until needed. Heat the olive oil in a skillet on medium-high heat, and cook and stir the chicken breast strips until they are beginning to turn golden and are no longer pink in the middle, about 8 minutes. Stir in the salsa, 1 tablespoon of honey, and 1/2 teaspoon of cayenne pepper. Reduce the heat to medium-low and simmer, stirring occasionally, until the flavors have blended, about 5 minutes. Stack the tortillas, 4 at a time, in a microwave oven and heat until warm and pliable, 20 to 30 seconds per batch. 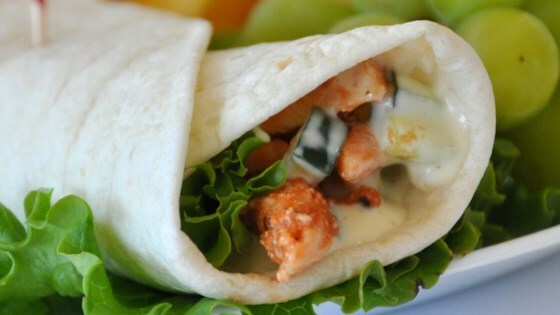 Spread each tortilla with 1 tablespoon of the mayonnaise-cucumber mixture, top with a layer of baby spinach leaves, and arrange about 1/2 cup of chicken mixture on the spinach leaves. Fold the bottom of each tortilla up about 2 inches, and start rolling the burrito from the right side. When the burrito is half-rolled, fold the top of the tortilla down, enclosing the filling, and continue rolling to make a tight, compact cylinder. These were a hassle to make. They honey was a pain and would not mix with the dressing. Loved this recipe! So easy and delicious! These are pretty spicy, but so good! Don't change a thing, and it's no big deal if you don't have cucumber.